This 10 year old Glen Moray is quite extraordinary single malt whisky – it’s been matured completely in Chardonnay casks. Glen Moray, the most northerly Speyside distillery, has a non age stated version with Chardonnay cask finish as well. But this beauty has been aged in Ex-Wine cask for 10 years! 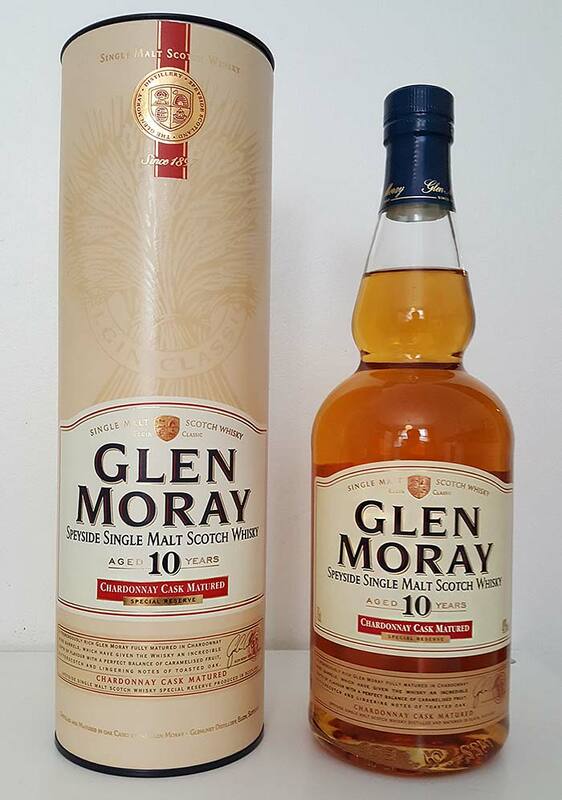 Glen Moray was founded in 1897 in the capitol of Moray and it is owned by La Martiniquaise. By volume it is the 6th biggest malt whisky brand in the UK and it probably has a low quality image because of its cheap prices. I must admit I like this distillery. The low prices don’t show in the quality. And they do know how to make experimental malt whisky. For example, Glen Moray has released a distillery only single cask whisky matured in Chenin Blanc casks, bottled at 60,7% ABV. They’ve also made an single malt whisky aged 13 years in new oak casks. So needless to say: folks at Glen Moray distillery have got some pioneer spirit in their production. Glen Moray 10YO Chardonnay Cask is crispy yet mellow, and it has character. So it’s quite a mix of opposite sensations. I could use Sideways as the reference, but A Good Year suits better. That movie has a more positive vibe, just like this whisky makes you feel happy and light. In the movie, A British investment broker played by Russell Crowe inherits his uncle’s chateau and vineyard in Provence. After you taste Glen Moray 10YO Chardonnay Cask, you kinda feel like being in a vineyard in Provence. Nose: Starts with mellow sweet notes – marshmallows and ripe green fruits. Turns quickly into tangy red wine with rubbery and oaky feel. Bit nutty, lemon drops dominating at the end. Taste: Very crispy and quite sweet. Mix of sour and sweet notes. Lemon and sugary cereal, even little bit of sherry feel. Finish: Grassy and fruity. Wee spicy but the spices are just a glimpse in this crispy, yet sweet fruity dram. Fresh green grapes rise nicely in the aftertaste. Balance: Sweet and sour single malt in quite good balance. This dram has wee bit character and it surely is a “bang for your buck whisky” since you can get it for 30-40 euros. Aromas and finish are the highlights of this whisky. Nice Job by the folks at Glen Moray distillery.